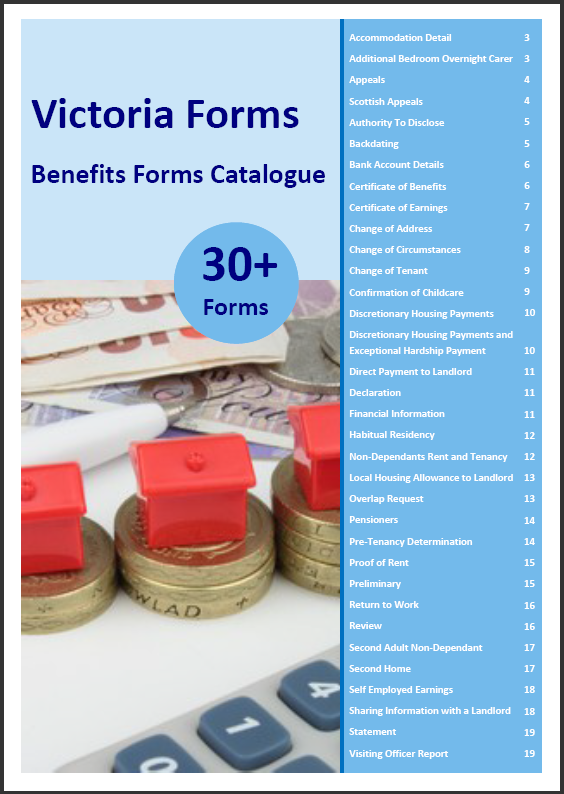 Welcome to the Victoria Forms Resource Hub – here you will find links to demonstration pages and forms libraries, a range of Case Studies and other useful information about the products and services we offer. Our Case Studies show how different combinations of products can make a real difference to your organisation. 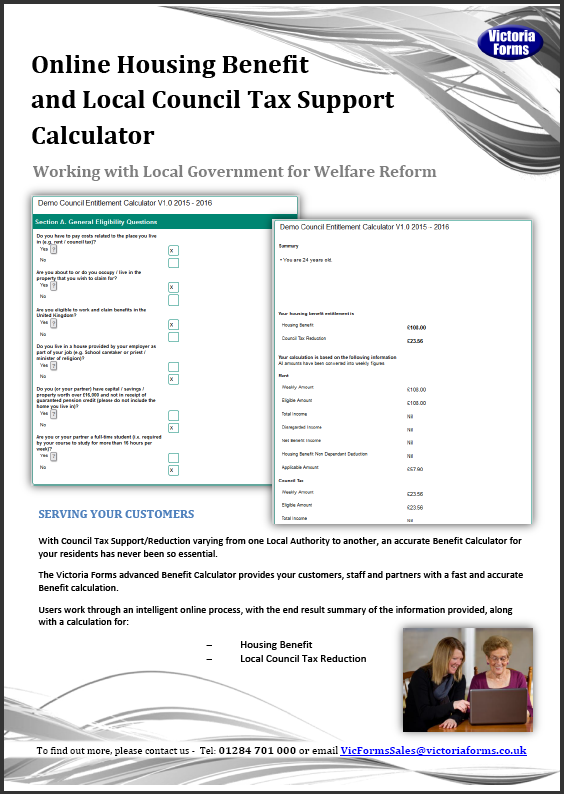 Find out about Councils using our systems for Revenues and Benefits, Licensing, Universal Credit and more! 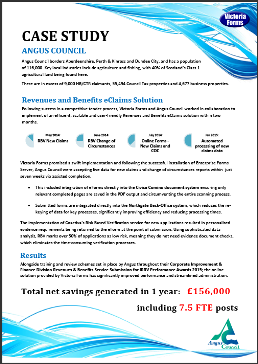 Angus have seen some fantastic results from their implementation of Victoria Forms software alongside training and review schemes for their Revenues and Benefits Service. 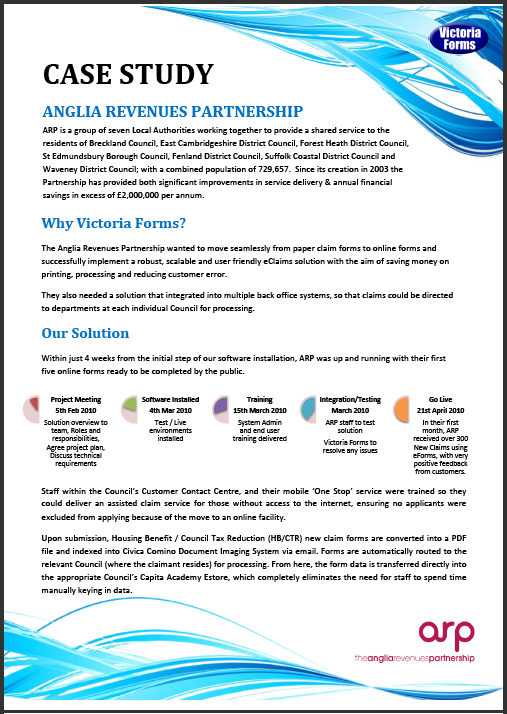 The Anglia Revenues Partnership is a group of seven local authorities who provide a shared service to residents. 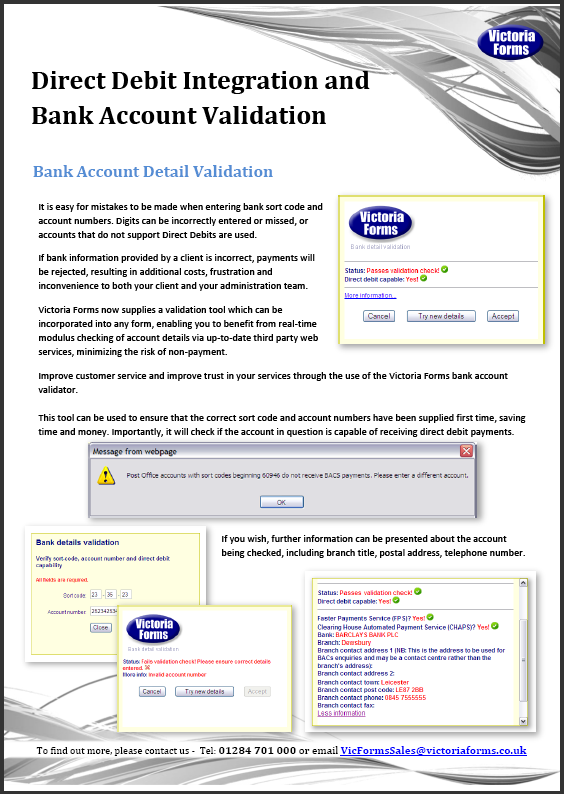 They have invested in a number of technologies including Victoria Forms, which has provided a solution that can be tailored to each specific Council for quick processing. 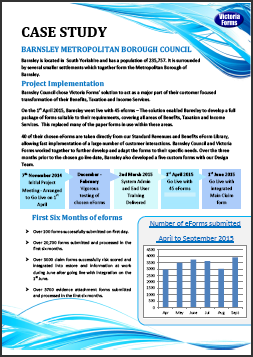 Barnsley have taken full advantage of our ready-to-use forms libraries, implementing 45 eForms in one go. 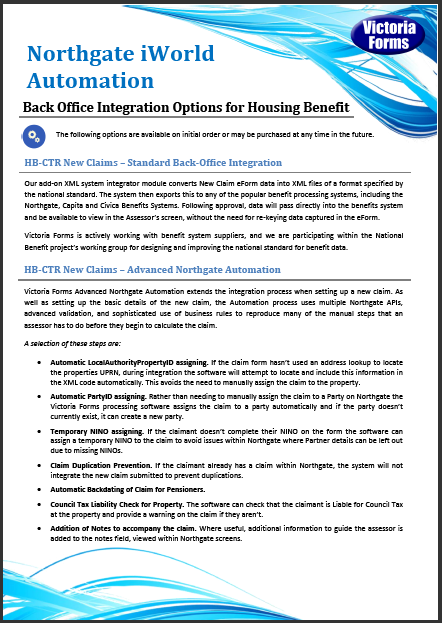 High volumes of claims are submitted every day, prompting Barnsley to seek time saving efficiencies such as Risk Based Verification and Back-Office integration. 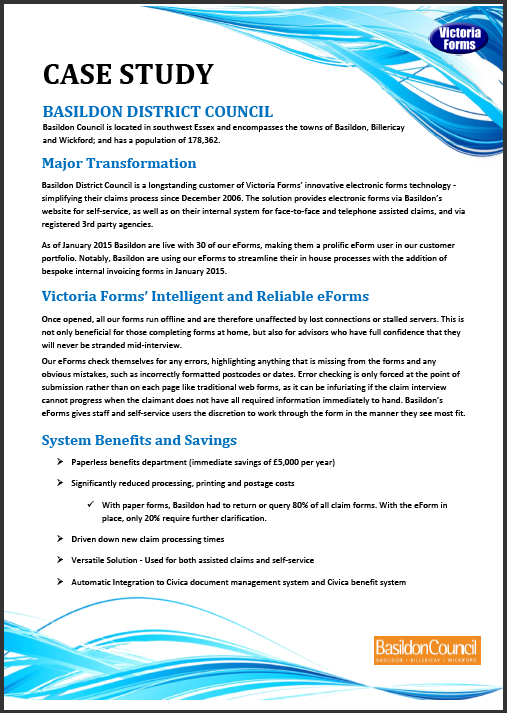 Basildon Council has embraced Victoria Forms eForm technology, using over 30 forms for their Revenues, Benefits, Business Rates and Housing Departments, as well as developing custom eforms to streamline their internal processes. 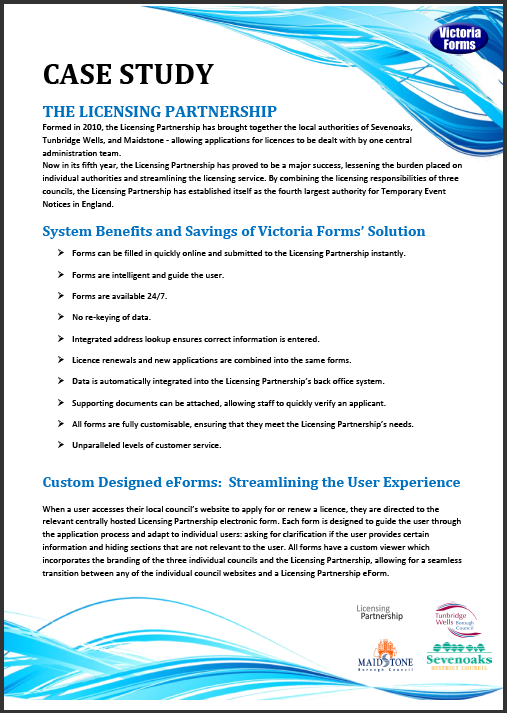 The Licensing Partnership is a combination of three local authorities, allowing licences to be dealt with by one central administration team. 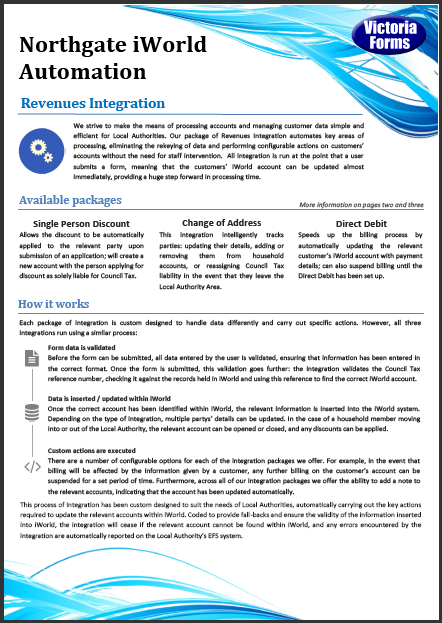 Their eForms include Payment Integration and advanced back office integration directly into Idox Uniform. 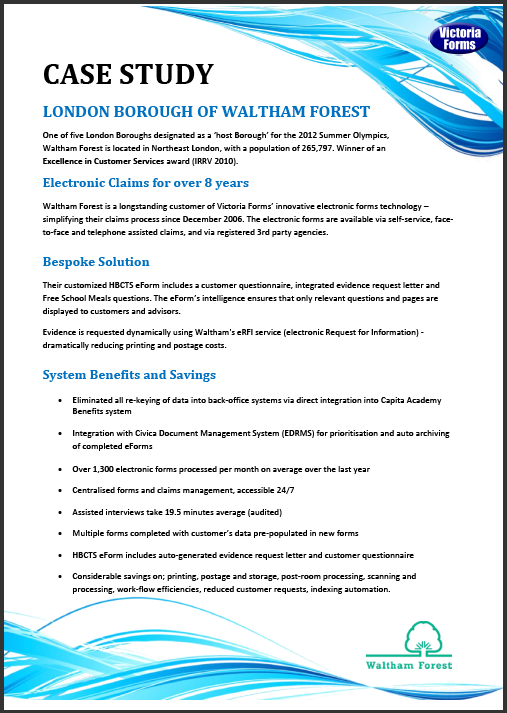 Waltham Forest have been a customer of Victoria Forms since 2006, and have taken advantage of the numerous Add-On Modules available that enhance Victoria Forms software – Intelligent document management system routing, Risk Based Verification, Back Office Integration and more. 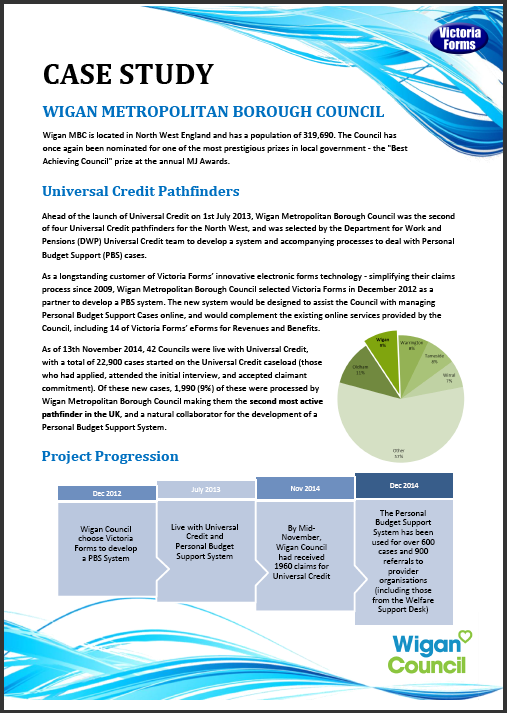 Wigan are a Universal Credit pathfinder for the North West, tasked with finding the best way to handle Personal Budget Support (PBS) cases. 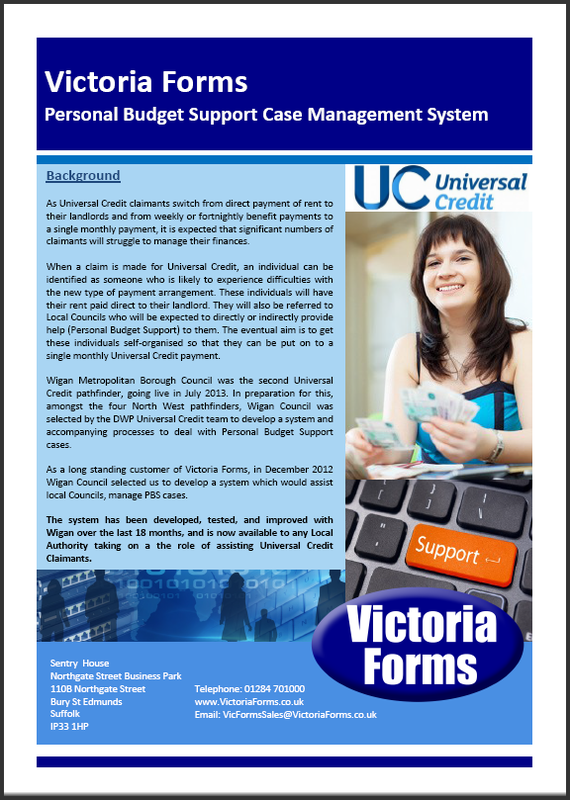 Victoria Forms developed a PBS system tailored to managing cases and referrals easily, which complements the existing Victoria Forms system. Technical Support is available Monday to Friday (excluding UK public holidays) 9.00am to 5.00pm. We aim to respond to an email or support call notifying us of any non-critical service problems as soon as possible, and critical service problems within 2 business hours. 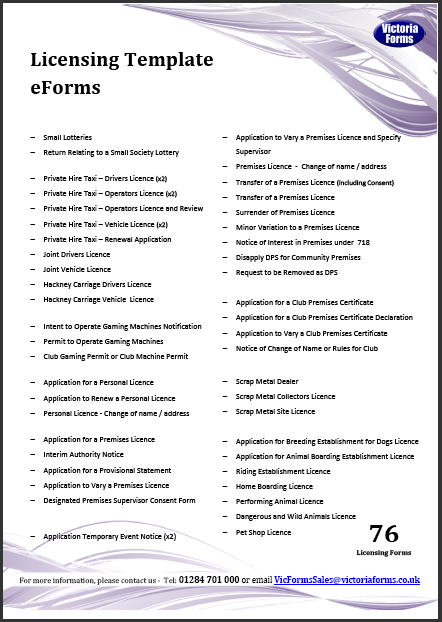 We have a comprehensive selection of detailed instruction manuals, and can organise webinar training sessions with one of our knowledgeable members of staff. 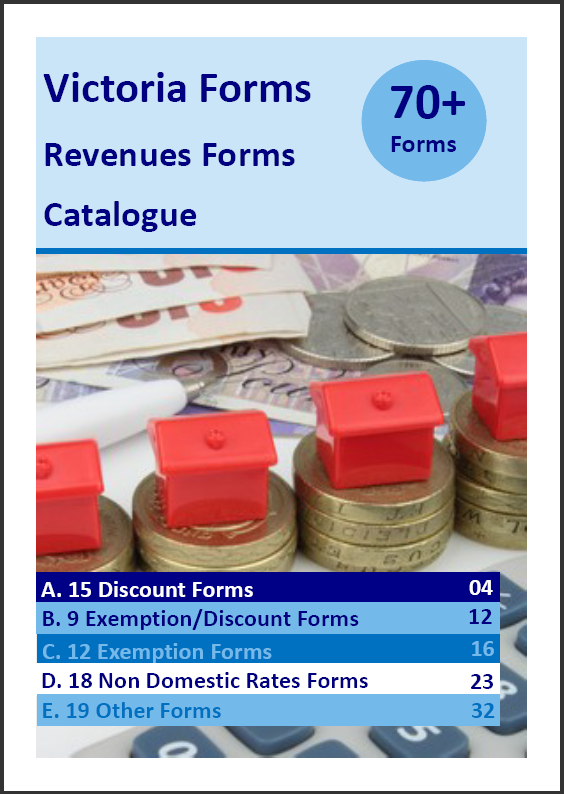 We provide a range of E-Forms and applications for you to try. 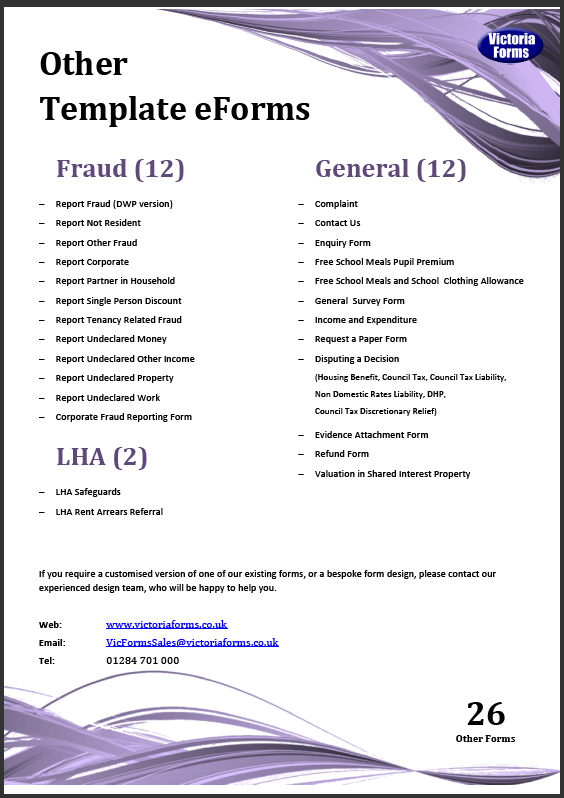 If you would like to access our demonstrations forms library, which contains an up to date catalogue of all our working standard forms please contact us. We also provide meetings where one of our representatives can show you our software and solutions, if you would like a demonstration of our products please contact us. We travel to you or set up a webinar to discuss your project in detail. Here is where we establish timescales for the project and determine the best delivery method to fit in with your existing processes. 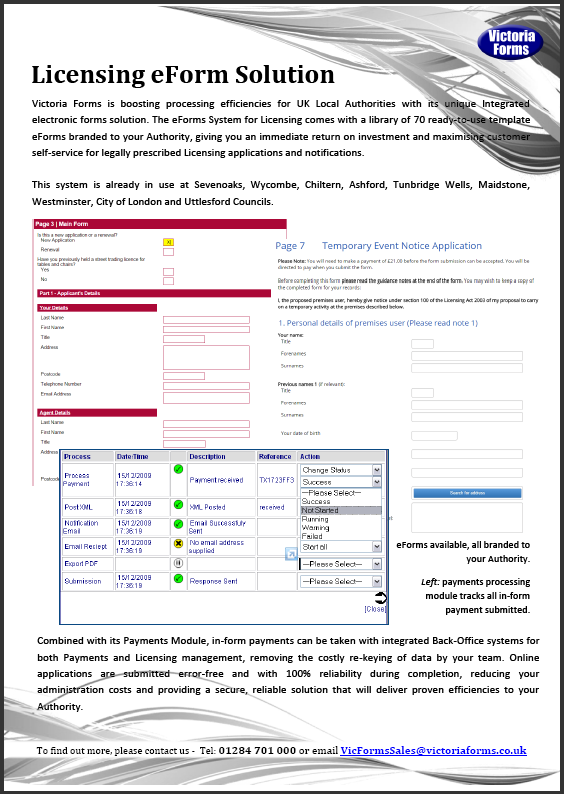 We work with your team in to plan your E-Forms project. 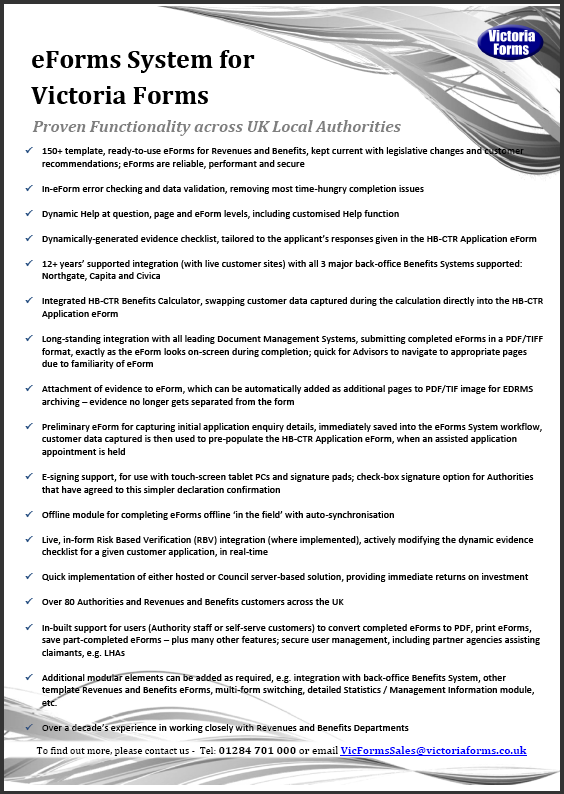 Our E-form specialists will design, build and deploy E-forms with you. 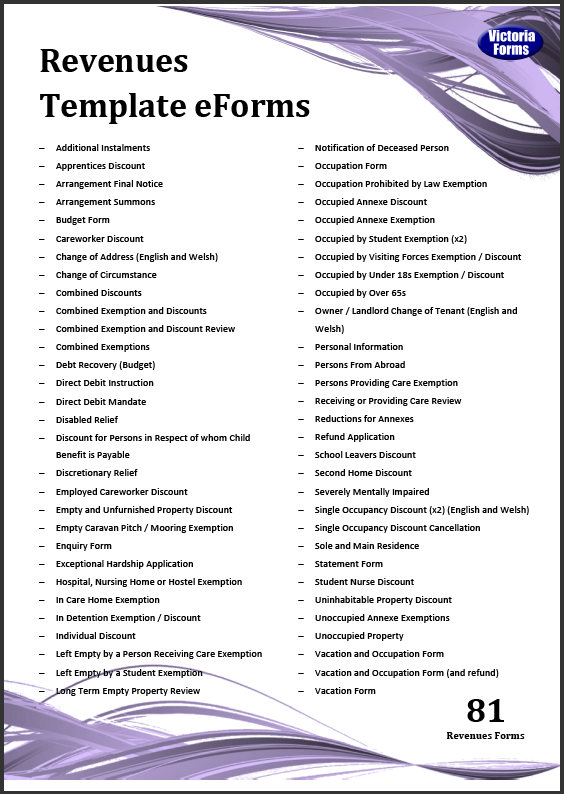 Our services can extend from one form to many: We can implement a phased conversion of your entire forms library to electronic versions, or we can convert individual, mission critical forms, and build tailored applications around them. 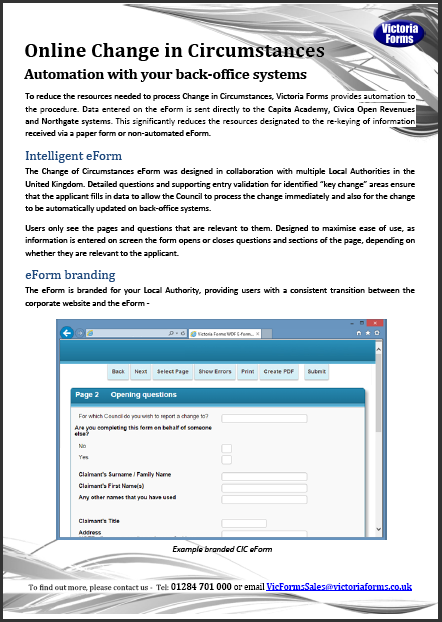 Victoria Forms staff will also style and brand the forms according to guidance from the council staff. 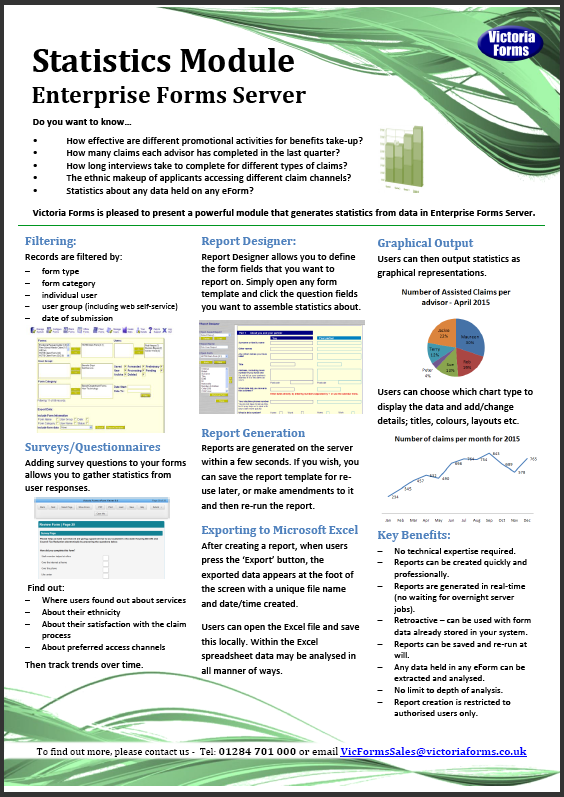 We also provide custom training courses, tailored to the needs of your E-form project. 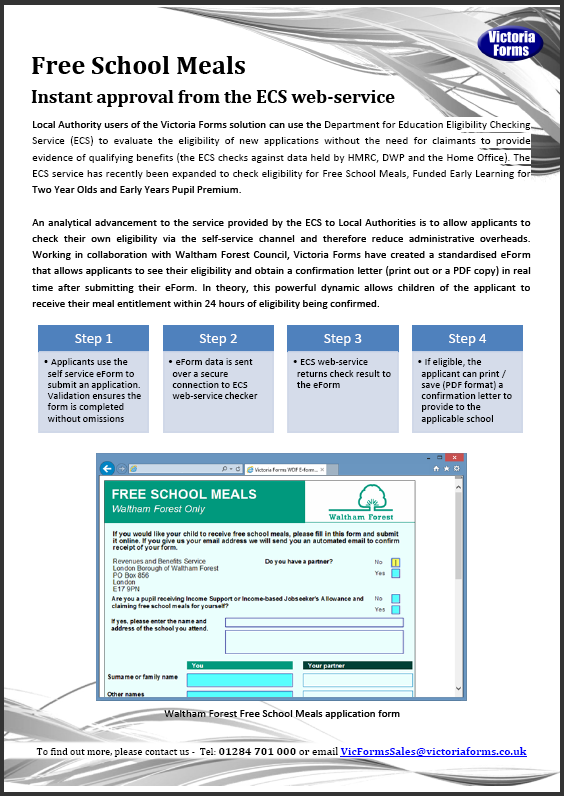 Victoria Forms will visit you to provide training for key staff in the use of the system and online forms themselves. We conduct training on site, with a full day set aside, to conduct training course tailored your requirements. This will typically be a “train the trainer” approach, where key admin staff will be given a detailed, hands-on run through of all aspects of the system. The Admin training program typically takes 1.5 – 3 hours for staff. 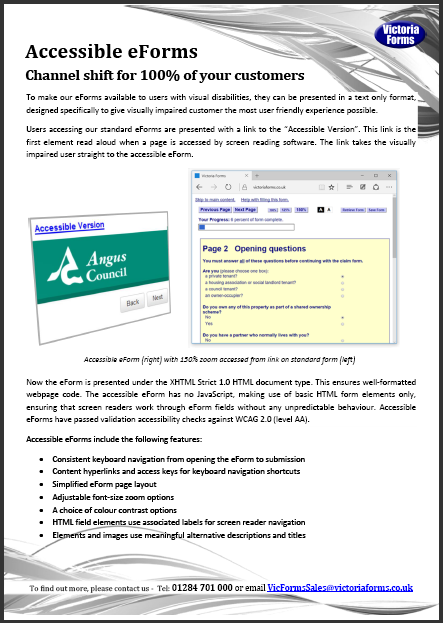 If required, the Victoria Forms trainer can run through “user” level training for staff that will be accessing and completing forms in an assisted mode. User training takes less than 2 hours. For organisations that have non-standard requirements for their use of E-form processes, we provide custom software development. 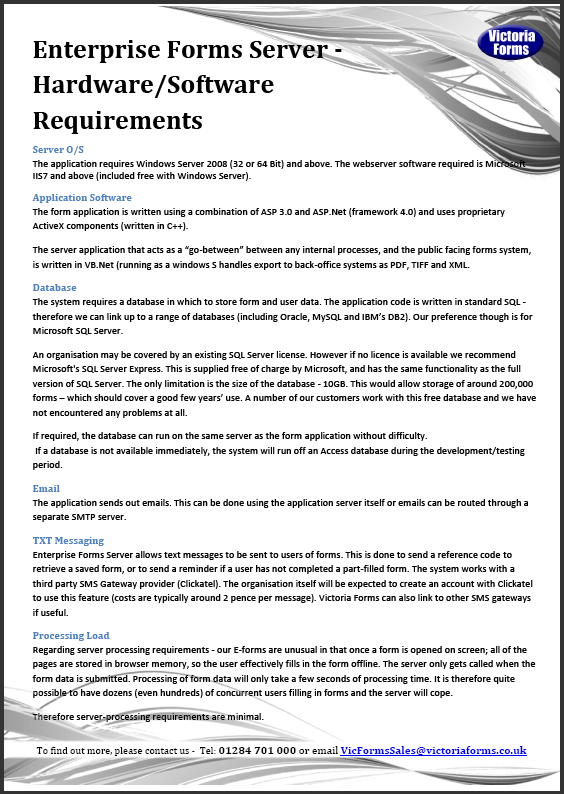 Our programmers can write bespoke add-ons to our existing software products to fit in with your needs. For software developers using our E-form technology for your own projects, we provide programming support and custom code for using our software to fast-track your project’s completion. Response to an email or support call notifying us of any non-critical service problems as soon as possible and in any event within 8 business hours Monday to Friday (excluding UK public holidays). Response to an email or support call notifying us of any critical service problems as soon as possible and in any event within 2 business hours Monday to Friday (excluding UK public holidays). We offer secure hosting services for all our solutions if required. Alternatively, our software can also be hosted on existing servers, with setup and maintenance guidance from our experienced team of technology staff. Victoria Forms design team will maintain the form content. 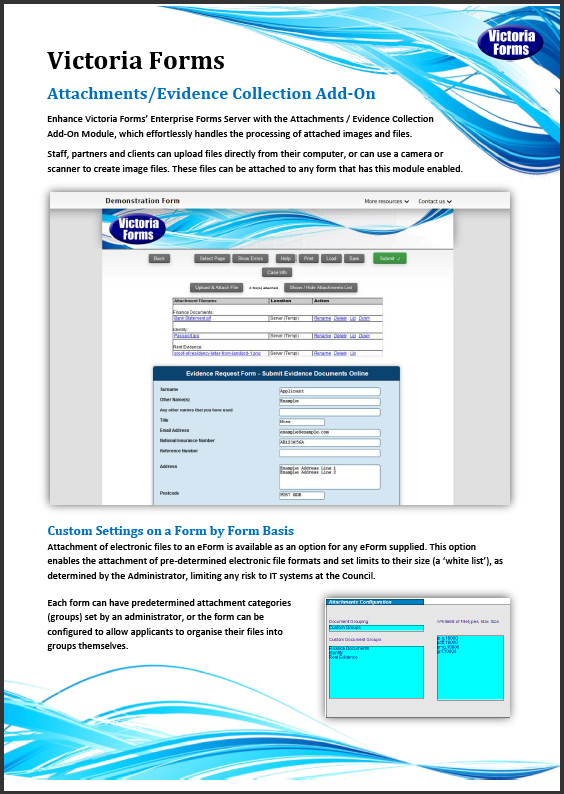 We make regular updates, improvements and additions to eForm libraries. All forms are adapted for regulation changes. 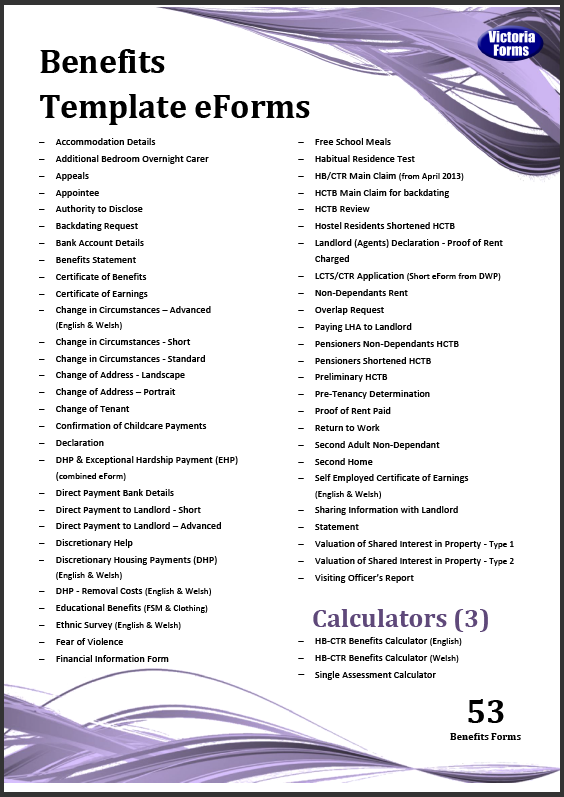 With major changes, we create a dedicated website for our customers 1-2 months before changes are due to go live, and make previews of forms, and our calculator available to customers, giving us time to make any changes according to any received feedback. 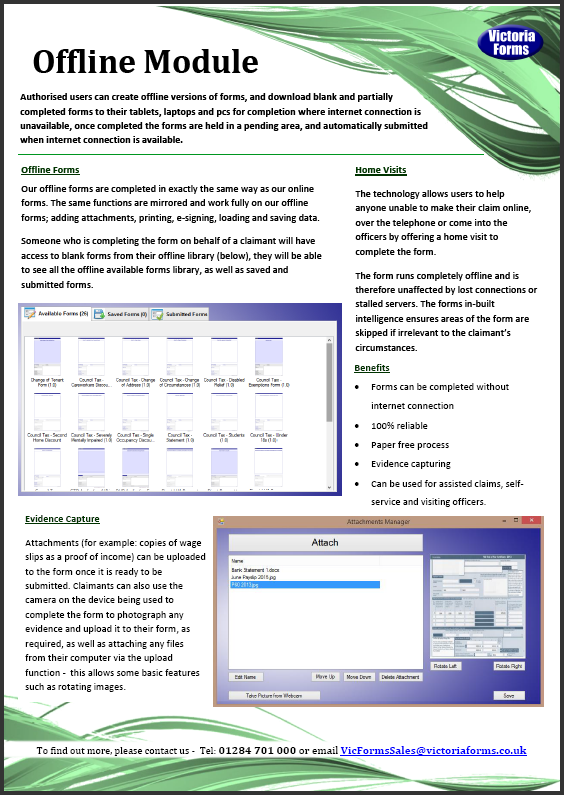 Updated forms are then added to the system, and can be turned on by an administrator, at the appropriate time.